Trial and tribulations of truffle making. You would think that making truffles are a joyful, pleasant experience. The process of making truffles should allow one to indulge in the repetitive activity to calm the senses during this time of year. Unfortunately, my first experience with truffles, did not come with calming feelings but lot of frustration because of these tiny balls of spiked chocolate. First thing I advise, allow yourself time for making these. I guess that why they do them at Christmas. Second, gather your materials and stock up big time on them. You never know what will go wrong. Lastly, do research before you attempt making them especially advice on decorating them. It will save you lot of melted puddles of truffles and ugly balls. The festive designs are associated with a different flavour. All liquor spiked but that is what this time of year is about anyway. 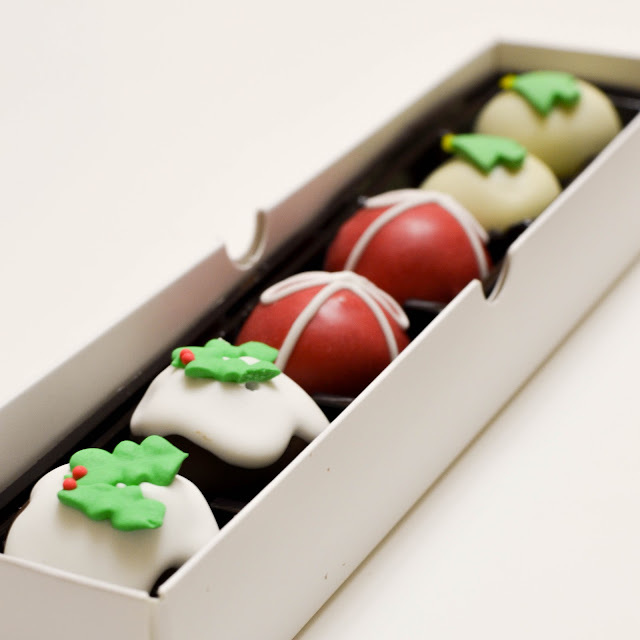 Christmas is the time of indulgent treats and little (or lot) of excess, plus who can turn done cute chocolates? 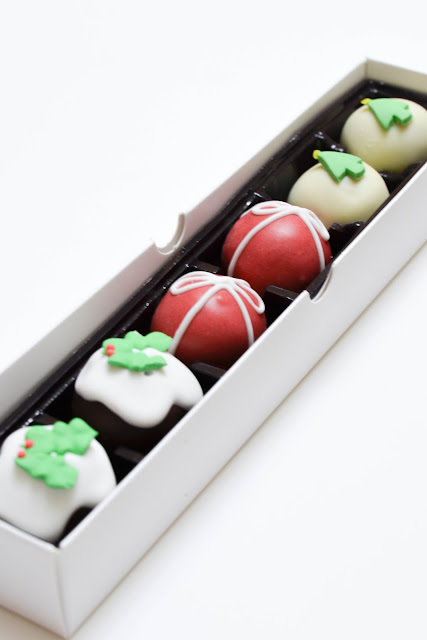 The Christmas pudding is amaretto milk chocolate truffle. The red present is a white chocolate eggnog truffle. 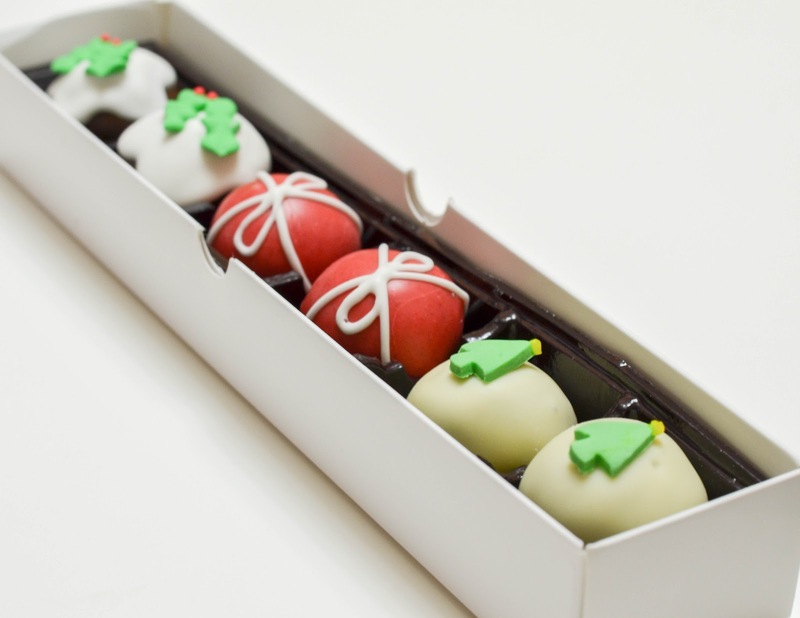 The white ball with a fondant decorated Christmas tree is black raspberry liquor truffle. Adapted from basic recipe at taste.com.au. Place the chopped chocolate and cream in a heatproof bowl over a saucepan half-filled with simmering water (make sure the bowl doesn’t touch the water). Stir with a metal spoon until chocolate melts and the mixture is smooth. Stir in rum. Place in the fridge for 4 hours or until the mixture is firm enough to roll into balls. Line a tray with non-stick baking paper. Roll two teaspoonfuls of chocolate mixture into a ball. Place on the prepared tray. Repeat with remaining chocolate mixture. Place in the fridge for 1 day. Repeat the same steps for making truffles as above. Repeat the same steps for making truffles truffles as above. Line a tray with non-stick baking paper. Divide the truffles into 4 batches. Remove 1 batch from the fridge. Dip, holding the bamboo skewer in the melted tempered chocolate to coat. Hold , allow for excess chocolate to drip off. Stick into a foam box, allow to set. Repeat, in 3 more batches, with the remaining truffles and melted chocolate. Place the white chocolate melts in a heatproof bowl over a saucepan half-filled with simmering water (make sure the bowl doesn’t touch the water). Stir with a metal spoon until chocolate melts and is smooth. Spoon the melted cooled white chocolate on to the top of the truffle on the foam box. Top with holy leaf. Melt red candy melts on a pot of simmering water. Stir constantly until smooth. Keep warm on a bowl of warm water. Hold allow excess candy to drip off. Prepare a medium hard royal icing to the same texture as outlining sugar cookies. In a zip lock bag spoon royal icing into bag. Sip an edge and slowly pipe a cross and two ovals to represent the bow. Colour white fondant green, roll out. Using a small tree cutter made from an old soft drink can(bend and shape it), press out small trees. Dip, holding the bamboo skewer in the melted tempered white chocolate to coat. Gently tap the fork or dipper on the edge of the bowl to allow excess chocolate to drip off. 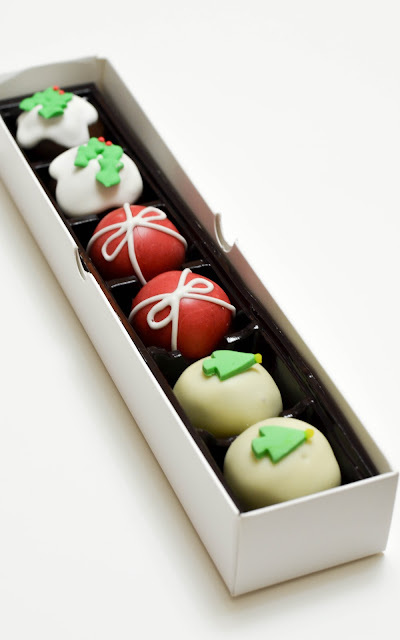 Spread a small amount of white chocolate on the back of fondant trees and stick on the top of setting truffle. They were ordered from a packaging supplier here in Australia.